As of January 2016: I am no longer offering any forms of Rushing due to ongoing elbow and shoulder injuries (and a cease and desist order from my orthopedic doctor). Rushing is very hard and demanding on the body and only aggravates and worsens my shoulder and tennis elbow. It is with great reluctance as I so enjoy the seat transformations. The most efficient and accurate way to get information and estimates is through e-mails with photos. Inquire about pick up and delivery through Columbus. Especially if you have a seat or back that is removable (typically with 2-4 screws on the reverse) you are in luck- it is very easy to ship a panel for rush replacement! Pictured is just such an example- seat removed from the chair, shipped, rushed and shellac, and shipped back home and installed back into the chair. And it is not uncommon for people to ship whole chairs. Sue Muldoon at Redux For You in Enfield, CT. Enjoy some information and a few before & afters of rushing projects from the past! WHAT IS IT? Originally, rushing referred to the natural rush material used to weave seats and backs out of hand harvested and hand rolled straw-like strand- typically harvested cat tail leaves. 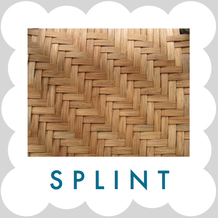 Today, rushing is a term used for the specific technique of weaving continuous rope around rungs to create solid seats and backs with a pattern that resembles triangles meeting in the middle- regardless of material used. For up-to-date before + afters check out my Facebook page! *Please note that these stools are for resting feet while sitting. Rush should never be used as a stepping stool.